Let me introduce you to one of the staples in my emergency self-help kit: chamomile tea. I think you’ll be surprised how much drinking a daily cup or two can do toward reducing stress symptoms. Chamomile tea is in my arsenal of little daily habits that I do to support and nurture myself. These habits serve to give me a nice stable foundation so that stress has less of an impact, and I bounce back more quickly. Come join me! Let’s choose stress reduction tools which fortify health! We know that stress feels awful, so it’s only natural that we should want to reduce those uncomfortable feelings as completely as possible. We all have favorite tools and strategies for reducing stress. Some of those which we turn to without thinking, have risks that outweigh their potential benefits. Despite knowing that alcohol, drugs, tobacco and sugar top this list – people rely on them because they are effective and do in fact work in the short term. The problem is that alcohol and other drugs offer us only temporary reprieve, and go on to store up problems for later by contributing to the deterioration of our general health. This subsequent erosion of health then becomes a source of physiological, biochemical and psychological stress. The better choice are stress reduction tools which fortify our health, and give us esilience from stress. Chamomile tea is one such thing we can use to reduce stress symptoms without negative effects on our health. I prefer to make use of resources which have been supported by a body of scientific research or have a history of medicinal use. Chamomile ticks both of those boxes. Chamomile is a member of the daisy family and has been used throughout Europe and Asia for its medicinal value. A recent cross-sectional survey of patients in Germany showed that 81% drank Chamomile tea for its calming properties. This can be supported by scientific evidence that chamomile possesses anti-anxiety properties. These have a calming effect on the nervous system and the ability to decrease anxiety and promote peaceful sleep. ”This finding does make sense as chamomile has been shown to have antioxidant and anti-inflammatory properties as well as to help reduce anxiety and depression”. So, how can chamomile have such promising positive effects on stress symptoms? Its mechanism of action – the chemical components responsible for chamomile’s efficacy – include Apigenin. Apigenin provides for a calming or sedative affect as it binds to the benzodiazepine site on GABA receptors. Bear with me for a moment whilst I unpack that last sentence so you can better understand the chamomile’s power to reduce stress symptoms. Apigenin is a benzodiazepine receptor agonist – a chemical compounds that slows down the body’s central nervous system. 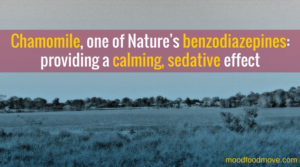 It is considered to be a minor tranquilizer, and potentiates the effects of GABA. Here is a nice explanation of the importance of GABA from Dr Ray Sahelian. GABA or gamma-aminobutyric acid, is the most important and widespread inhibitory neurotransmitter in the brain. Excitation in the brain must be balanced with inhibition. Too much excitation can lead to restlessness, irritability and insomnia. GABA is able to induce relaxation, analgesia, and sleep. Barbiturates and benzodiazepines are known to stimulate GABA receptors, and hence induce relaxation. 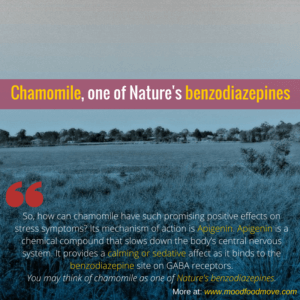 So, what that means is that the apigenin in chamomile provides a calming or sedative affect as it binds to the benzodiazepine site on GABA receptors. 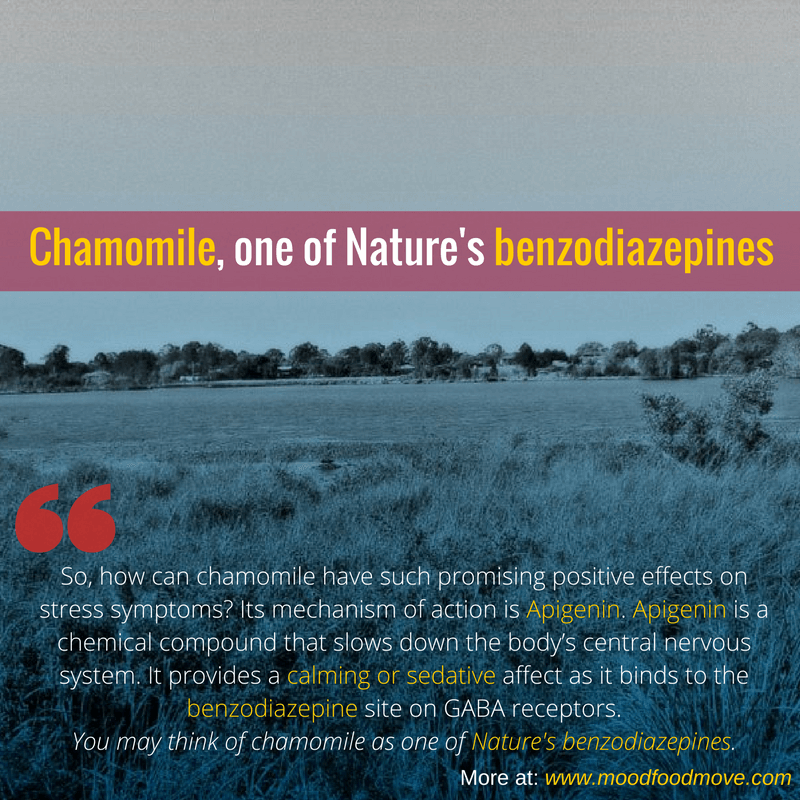 You may think of chamomile as one of Nature’s benzodiazepines. Now that we know how chamomile is so effective for reducing stress symptoms, I’ll share with you how I make best use of it. As part of my evening routine I brew my chamomile tea just before my evening meal – and let it steep for 20-30 minutes. This makes a reasonably strong cup of tea when brewed that long, and it may taste a little bitter. You may choose to dilute it between two cups and top up with hot water. If I am feeling particularly stressed I will make a second cup before I have my evening shower, and drink it at bedtime. Because chamomile tea is sedating it makes good sense to drink it in the evening. Please do not drink it at other times of the day until you know how the tea will affect you. I’d encourage you to speak to your doctor if you are taking prescription sedative medications – even though chamomile is safe and mild, it makes further good sense to keep your doctor in the loop. I love chamomile tea. It’s helped me get through many a rocky period in my life, extensive international travel, and a peripatetic lifestyle. I’d love to hear how it works for you.